Leverton saw off Kirton Town with a resounding 9-2 win in the Mason Bros Lincs Junior Cup, with goals from Nathan Rippin (three), Damian Gibbons (three), Ben Reeson, Dom Goddard and Dan Taylor. After two successive defeats, Benington gained revenge on Swineshead in their third consecutive meeting as the two Boston league sides clashed. A dominant display in the opening period laid the foundations for Benington’s success as they held a two-goal interval lead. A superb solo effort from Lucas Evison gave Benington the lead which was doubled by an audacious 35-yard strike from Tom Baxter, who collected a clearance before lobbing home from distance over an exposed visiting goalkeeper. Swineshead started the second half strongly and halved the deficit before Benington missed a late chance to restore their two-goal advantage when Evison dragged a last minute penalty wide. Coningsby produced a fantastic second-half fight-back to secure their place in the next round when they played hosts to Epworth Town. Trailing 2-0 at half-time, things looked as bleak as the weather. But the home side battled through the pouring rain to slowly claw their way back into the tie. Martin Maddison fired home a tremendous 30-yard free-kick to give his side hope in the second half before Shaun Boothby burst through and calmly slotted home the equaliser. Coningsby sealed a great victory when Tom Dickinson slung in a corner for Ben Brown to thunder home a header to make the final score 3-2. A Liam Papworth goal proved to be enough to earn Spilsby Town a place in the next round. Papworth’s winner at Market Rasen made it a triumphant journey home for his side and make it four Boston League sides through to the next round. The only side not to make it was Fishtoft who had a difficult journey to Hykeham Town, and so it proved to be as the Division One side went down 4-1 after a brave fight. 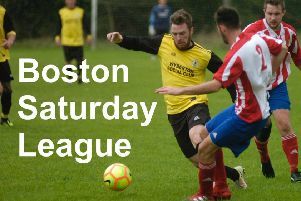 The heavy overnight downpours caused the postponement of several games in the Boston Saturday League, but there was also one other notable postponement which had nothing to do with the inclement weather. That was involving the Premier Division clash between Billinghay Athletic and Heckington Millers. The Heckington club withdrew from the league two days earlier because of ongoing problems which saw the team rooted to the bottom of the table. They never recovered from an exodus of players, many of which had opted to turn out for other Sleaford-based teams and the club felt that they had no other option but to pull the team from the league. Their application to withdraw will be confirmed at the December Management Committee meeting and their previous games will be declared null and void. The other two scheduled fixtures in the Premier at Boston College and Pointon failed to go ahead because of waterlogged pitches. Fosdyke suffered another defeat when they entertained Old Doningtonians in a crucial Taylors Peugeot Division One relegation battle - and the basement side will be disappointed after starting very well, being defensively sound and posing plenty of threat going forward. James Munn tested the keeper with a rasping shot and new signing Ollie Pinner forced him in to a spectacular save. At the other end the visitors brushed the post and had a goal chalked off for offside. Pinner opened the scoring with a clever backwards header but it didn’t last long, however, as when Ian Jack Smith punched the ball away while under pressure, Andy Slaughter had the easy task of heading in to an empty net. Worse was to follow when Smith came out to claim a cross and was wiped out by a challenge that left him bamboozled on the floor seeing stars. The referee didn’t see anything wrong with the challenge and, again, the ball was slotted into an empty net, this time by Mark Sharman. Fosdyke almost grabbed an equaliser when Pinner squared a ball for Leon Marsh but his finish was sliced wide. The second half went from bad to worse for Fosdyke as they conceded further sloppy goals from Mark Sharman and Jamie Welsh. Pinner went very close when faced with a one-on-one but found the keeper equal to the task, but by the time a fifth hit the net from a Liam Barnett free kick the game was over and Fosdyke were left wondering what had hit them once more. Fulbeck United went one better scoring six in their game against FC Kirton. Callum Clay (two), Martin Wilson, Chris Bates, Dean Jones and Jason Barratt were all on target for Fulbeck, who moved into second place following their win. Friskney striker Greg Brown hit all of side’s goals in their 3-2 home win against Swineshead Reserves. Friskney held a 2-0 lead when Swineshead had a player sent off and amazingly the visitors somehow clawed their way back into the game with a two-goal reply to level the scores at 2-2. Brown had the last, however, when he grabbed the winner. The derby between Woodhall Spa United and Horncastle Town kept referee Richard Mather busy as tempers flared. The sending off of The Woodhall Spa captain proved to be their downfall in a 3-2 defeat. There was only one postponement in Division One and that was the match between Freiston and AFC Tetford where The Danny Flear Community Centre field was under water in places. Only two games out of the five Taylors Ford Division Two fixtures survived with Wrangle going down 3-1 at home at the hands of Park United, and Billinghay Reserves winning 4-0 away at Swineshead A. Park United produced their best display of the season at Wrangle and they took the lead after 15 minutes when Ryan Huskisson put away a powerful header from a Tom Limb corner. Park extended there lead on the hour mark when Jimmy Harris scored following a Ryan Croom through ball. FC Wrangle pulled one back following a long range free kick from Jack Hill that, in the wet conditions, squirmed under the keeper’s body before Park finally sealed the victory 15 minutes from time when Croom headed home a Ben Dean corner. Swineshead probably didn’t deserve their heavy home defeat after playing well against a strong Billinghay side who hit four goals without reply. Joe Stainsby, Frazer Howseman, Ben Gilbert and Adam Underwood-Harley hit the Billinghay goals. Two matches were lost in the Taylors Vauxhall Division Three- at Wyberton A where the pitch was unfit and at Boston Titans where a lack of players caused them to postpone their home match against Spalding Harriers. The Spalding side will, therefore, be awarded the three points. Northgate Olympic just edged out Leverton Reserves at home by the odd goal in seven. Ryan Frost, Neil Christian, Conor Yarwood and Gareth Tomlinson grabbed the all-important goals for Northgate in a 4-3 home win.